After a 7.8-magnitude earthquake struck coastal Ecuador in April 2016, Mariana López experienced a momentary loss of hope. The beloved Faith & Hope School building that was providing vital help to the kids in Pedernales was in ruins. The thought struck her that the school might never rise again. What would happen to these vulnerable children? It’s been three years since the earthquake devastated the Faith & Hope School. Not only has the school risen from the dust and relaunched with the help of ER donors and work teams, but Mariana said the kids are rebounding. “The lives of the children who attend the reading, writing and math classes in our school are being blessed. The parents are very grateful for the teaching and the love their kids receive. “Jose is 12 years old. He has four siblings and lives with his mother and father. Last November, he joined a group of kids who attend the school. The teachers were worried because Jose was violent. He used to argue with his classmates and teachers and threatened his teachers if they didn’t pay immediate attention to him. *Mateo, 8, also has struggled with anger, but it has subsided because he realizes he is love. *Marta, 13, couldn’t read or do math a few months ago. Today she is reading and her math has greatly improved. *Shirley was about to fail grade 5. Today she is reading and writing much better. *Many moms recently learned to hand-make crafts to sell to provide finances for their families at the school. Mariana shared her appreciation for the help they have received and invited readers to visit the school in Pedernales to spend time with the children and parents in the community. Thank you for your investment in these kids’ futures. You can help turn more bleak futures into futures filled with hope and opportunity. Click here to mobilize your time, treasure and talents. Or, email us at mobilization@extremeresponse.org. 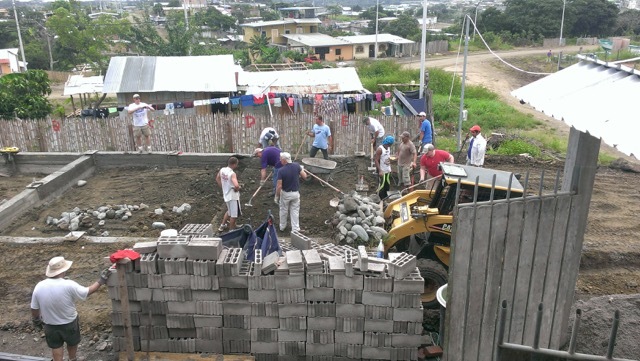 The construction of the Faith & Hope School in Pedernales, Ecuador is almost complete. One day after the earthquake, I thought the reconstruction of the school in Pedernales would not take place. But I was soon filled with hope and was convinced God would rebuild the school even better. In these photos, you’ll see some pictures taken a week ago. The kids now have a cobblestone floor patio where they can play – where there was only dust before. This provision has exceeded our expectations. Scroll below to read more about the rebuilding of the Faith & Hope School, plus other earthquake response work ER has facilitated in Ecuador. A huge thank you to supporters! It was 29 months ago that the Faith & Hope School in Pedernales was destroyed by the massive 7.8-magnitude earthquake that left hundreds dead and thousands homeless. With the generous support of donors, ER was able to help rebuild several homes plus take on rebuilding the school. While there have been many obstacles, including engineering, earth stabilization, construction teams, materials and more. But thanks to our Quito staff and the Alfalite Foundation that operates the school, it’s finally nearing completion. “Here is an update on the school ER has been helping rebuild after the earthquake. We are close, but not quite there yet. Per custom, the people here will start using the school now. Windows, tile and paint are all luxuries. The need to use the building now takes priority. “So it is rare to see a school like this ever get finished. People who have donated move on and lose the vision. So the funding never comes. Hope this doesn’t end this way and that the school can be completed as it should be. Scroll below to see posts from previous trips to work on the school and some of the homes we helped rebuild. We need more volunteers and teams to come and help finish this school and other projects. Visit our Mobilization page to learn more. It was just two years ago that the devastating earthquake rumbled through coastal Ecuador leaving thousands of people to start over. ER was able to provide emergency supplies and rebuild several homes thanks to the generosity of donors. One casualty was the Faith & Hope School in Pedernales, which was so damaged it had to be completely demolished. During the last two years, ER has helped rebuild the school. It’s been a slow process because of the need for stringent soil testing, engineering plans and earth-quake resistant foundations and structural supports. But with the help of donor earthquake donations and volunteer teams, we’ve made good progress. Today, according to ER’s Pete Emery, the school is working with adults three times a week and the kids two times a week. Pete is overseeing the final push to complete the school’s second floor. He and an ER contractor are drawing up plans to have a team come and finish the project hopefully this summer. We need volunteers to come to Ecuador to finish the second floor and more at the school. Click here to learn about short-term volunteer teams. Or email us at moiblization@extremerepsonse.org. Ecuador Quake: Faith & Hope School Rises! In April 2016 a massive 7.8-magnitude earthquake leveled hundreds of buildings in coastal Ecuador. One of those buildings was the Faith & Hope School. ER donors and volunteers responded (scroll below to learn how). Today we want to share this video provided by ER’s Pete Emery showing the tremendous progress on rebuilding the Faith & Hope School. From demolition to soil testing to engineering and architecture to permitting to construction. The school plans to start using the first floor shortly! We still need volunteer teams to come to Ecuador to finish the second floor and more at the school. Teams usually consist of 5-20 volunteers. While no construction experience is required to join this team, it’s helpful if a couple people on the team have at least some construction knowledge. Want to send a team? Click here to learn about short-term volunteer teams. Or email us at moiblization@extremerepsonse.org. Last year the Faith & Hope School in Pedernales was wrecked by the massive 7.8-magnitude earthquake that rocked coastal Ecuador. Today, following months of soil testing, engineering and permitting, the school now has a new foundation and first floor. A team of volunteers from Calvary Church of Souderton, PA, poured the cement. More importantly, they poured into the community by showering the kids and families with love and compassion. The Calvary team was involved with the original build of the school in 2011. When the quake caused so much damage, the church immediately sent $10,000 for relief work. Then, when they heard what happened to the school, they stepped up to help the rebuilding effort. As ER’s Pete Emery began working with Fundacion Alfalite, the organization that operates the school, he rekindled the relationship between Calvary and the school. Two men, Ed White and Mike Awkland, were part of the original Calvary team in 2011 and helped lead the second rebuild. The team prepped the ground for the foundation and poured the first floor. They also helped weld and place the columns and beams for what eventually will be a two-story building. The team worked in very hot and humid conditions, which made work difficult. Despite working extremely hard, they did an amazing job of playing with kids and building relationships with local workers. The team also partnered with Hands in Service, an organization that provides clothing, shoes, diapers and other items from manufactures and donates these items to people in need. Ed Tornetta heads that up and brought a ton of jeans and shoes to donate. The team went into a very poor neighborhood to hand out the clothes and invite the kids and adults to attend the school and adult education program once the school opens. Watch this blog for future updates on the rebuilding of the Faith & Hope School. Scroll below to see past posts on ER’s Ecuador earthquake response. From demolition to soil testing to engineering and architecture to permitting to construction. The school plans to start using the first floor shortly! 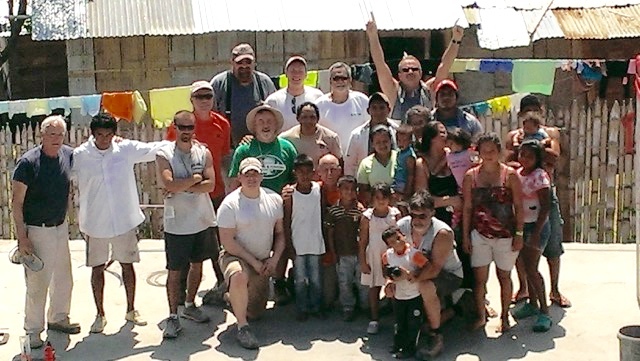 We need volunteer teams to come to Ecuador to finish the second floor and more at the school. Want to send a team? Click here to learn about short-term volunteer teams. Or email us at moiblization@extremerepsonse.org. On April 16, 2016, coastal Ecuador suffered a devastating 7.8-magnitude earthquake the killed nearly 700 people, injured more than 16,000 and left hundreds of thousands homeless. ER staff, partners and supporters responded quickly by sending relief teams, emergency supplies and other resources. In this slideshow, we show where our five earthquake-induced construction projects stand today. Thank you to everyone who supports ER’s relief work. We’ll provide additional updates this summer as the reconstruction of the Faith and Hope School proceeds. Yesterday, ER staff helped stuff hundreds of relief bags with long-time partner Pan de Vida. Even though the quake hit in April, many families in the impacted coastal area continue to live in tents or substandard housing and are struggling to regain normalcy. The bags contain diapers, wipes, oatmeal, baby food, hygiene items, sugar, corn, beans and rice. The bags will be transported to the coast and distributed to struggling families. In the face of extreme circumstances, we are grateful to be able to share food, supplies, hope and encouragement to these families. Thank you Pan de Vida for organizing this effort and thank you Extreme Response donors for your generous support. Scroll below to read more about ER’s relief efforts. Thank you for helping the people of Ecuador! Twice-Destroyed Shrimp Farm Home Looking Good! (Thursday Aug. 5, 2016 Update) We continue to rejoice in the rebuilding of Pastor Fabian’s parent’s home (Earthquake Relief Project #2) which was destroyed twice during the April Ecuador earthquake and aftershocks. Today, the home has received more finish work. Thank you to all who have contributed to ER’s Ecuador Earthquake Relief Fund. Scroll below to see the home in its previous conditions. Imagine having your home destroyed by a massive earthquake, surviving, living in a tent for weeks and finally rebuilding…only to have your home destroyed AGAIN by a huge aftershock! The parents of ER partner Fabian Buenaventura (Casa de Dios) have endured this journey in the coastal area of Perdenales, Ecuador. The family home was leveled for a second time in early June. Unfortunately, the same aftershock that knocked down their first rebuild also destroyed the home of their builder, who was then unable to help them rebuild again. So the family has endured tent living for months. Finally, three months after the first 8.6-magnitude quake hit in April, the family home is nearing completion. They are very grateful for the support that ER supporters and staff have provided and plan to move into the new house soon. This would not be possible without the help of ER donors. They also shared their appreciation for the physical and emotional support of the ER staff. Thank you for helping ER pour into this family! “Last week we visited with Mariana López, who founded Fundacion Alfalite in 1976. They run the Faith and Hope after-school program, which operated out of the school building that has now been torn down. “Core samples have been drilled and an engineer commissioned to do structural drawings in order to get approvals to rebuild. Unfortunately, we learned that the foundation is unsuitable for rebuilding. If the core samples come back solid and the engineer is able to produce the drawings, Fundacion Alfalite could request building permits later this month and start the rebuilding process shortly thereafter. Thank you to all of you who have supported our Earthquake relief efforts since the 7.8-magnitude quake struck on April 16, killing more than 550 and leaving thousands homeless. Scroll below to see more of our previous updates. ER recently received this report from Mariana López, who is working with the Hope and Faith School in Pedernales. ER is helping to rebuild the school thanks to the generous support of donors. We have been to Pedernales several times since the earthquake, including trip on May 29. People are trying to go back to their normal life activities, but there is an environment of concern everywhere. There is an extreme lack of tourists in the area, which is one of people´s major sources of income. The beaches are empty, only visited now by policeman who provide security, some inhabitants of Pedernales who decided to not leave, fishermen, peddlers and a small number of people from other cities who moved to the site to provide some help. Access roads and streets in the area are cracked, making it very difficult for the “moto-taxis” to provide transportation (that is the predominant means of transportation in Pedernales). In these circumstances, people are obliged to charge high prices for certain services such as food, transportation and Internet. We could see that one of the few activities that are trying to return to normal is fishing; fishermen set sail despite the dangers that this activity brings, because it is their only source of income. Another important source of income was the hostels and hotels. But according to recent reports, 1,116 buildings were destroyed only in Pedernales, 87% of those were hosting sites. In the midst of destroyed places and people trying to revive their economy seeking ways to produce, this time we had the opportunity to deliver some clothes and awnings (screens) to mothers, children and their families. That opened the door for chatting and building relationships. We also donated a kitchen and its gas tank to the mother of three of the kids of the school, they lost everything in the earthquake. The work does not end. We hope to continue collaborating with many more families. This is the time when they need an outstretched hand. Scroll below to read more about ER’s relief efforts. Please designate your gift “Ecuador Earthquake Relief”. Thank you for helping the people of Ecuador! The people of coastal Ecuador endured great stress following the April 16 earthquake that destroyed so many homes, schools and infrastructure. They’ve waited for resources, workers and governmental approvals in order to rebuild. Thank you for supporting these efforts! (Wednesday June 15, 2016 Update) Thanks to the generosity of our donors, Extreme Response is supporting a fifth relief project that will replace housing destroyed by the massive April 16 earthquake and aftershocks that rocked coastal Ecuador. Our staff in Quito continue to seek out projects that can bring relief to those who have lost their homes, possessions, schools and more. 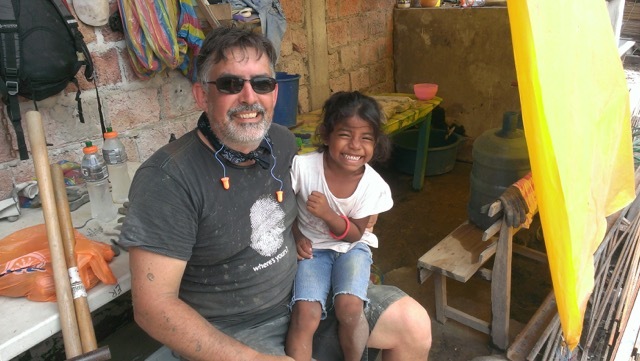 In this project, the fifth that we have committed to so far, longtime ER friend Ron Borman brought a team and supplies to the coastal town of Mompiche where he works with the Cofan Indians. The area was severely impacted by the earthquake and many families are without housing. 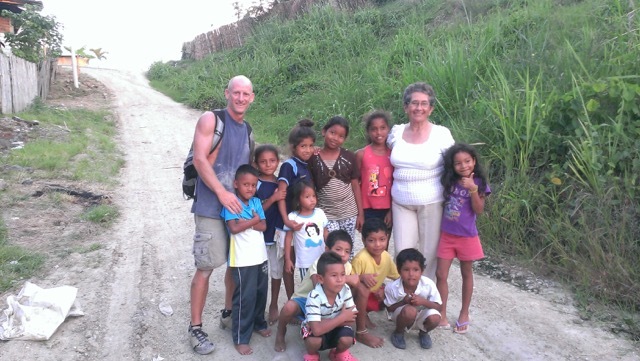 Ron shared this update: “Our trip to Mompiche went very well. Our team helped build 3 bamboo houses. We also spent time with the people of this community, handing out donations and doing a kids program. ER is currently working to schedule projects and short-term teams into 2017 to help with rebuilding. Scroll below to see some of our other projects and the relief work we did immediately after the earthquake. ER’s Paul Fernane shares this update from Perdenales, a coastal town in Ecuador that was near the epicenter of the April 16 7.8-magnitude earthquake. The Buenaventura family (parents of Fabian and Graciela – ER partner Casa de Dios) lost their home. Construction began on a new home, only to have a second quake damage it and their shrimp farm again. They’ve been living in tents while trying to rebuild their home and repair the dykes. Through our supporters, ER continues to help the family. Thank you to everyone who has donated to the relief work! Jeramy Hing is one of several ER staff members who participated in three relief teams to the earthquake-impacted coastal area of Ecuador. The first major quake was followed by numerous aftershocks, making recovery slow and dangerous. ER continues to invest in the recovery. Following are some insightful observations Jeramy collected from his experience. “It’s just stuff… I still have my life,” said one 68-year-old woman after being told she would not be allowed to re-enter her home to recover anything. This attitude was quite common among the people we encountered in the aftermath of the 7.8-magnitude earthquake that rocked the coastal region of Ecuador on Saturday, April 16, 2016. It was such an optimistic response to such a devastating situation. But how far does this sentiment reach into the hearts and souls of the survivors? Is this just shock or maybe a natural reaction to having just escaped death? What encouragement can be given for the days ahead that each survivor faces as they experience the challenges of starting over from scratch with nothing, and many having lost family or friends? What incentive is there to persevere and what motivates us to engage with people at a personal level and provide hope? We cannot fully comprehend the complexities of such travesties. Rebuilding projects are likely to go on for quite some time ahead. As time goes on, the reality of loss will begin to show its long-term effects on people. In fact, as I write this we have already experienced numerous aftershocks larger than 4.5 and two above 6.7. On one occasion I was with my colleague Pete Emery in the coastal town of Pedernales helping a family of one of Extreme Response’s partners (Casa de Dios) rebuild their home that was lost in the first earthquake. They were so thankful and encouraged by our presence, which was apparent by the hope in their eyes and the way that they engaged with us. We had dinner with them every night in their makeshift shack, and on one night during an aftershock the grandmother began trembling and needed comfort from other family members. We learned that she was in the house when it collapsed the first time and had to be dug out of the wreckage. We left that family with a fully built structure and a roof (scroll below to read about them), and some money to have the finish work done by a professional contractor. Unfortunately, during the 6.8-magnitude aftershock that hit on May 18, 2016 (one month later), their home and shrimp farm was damaged again when a dam broke during the earthquake. Extreme Response team members have been in touch with the family and we are continuing to offer support and encouragement. Honestly, it is through meaningful relationships and willingness to walk alongside of people during their ups and downs that life-changing hope and perseverance is nurtured. The people I met on our relief trips, and many more just like them, have had an equally profound impact on me. However, the thing that spurs me to action is the desire to have the most profound impact on the survivors’ lives going forward. Our family is so grateful for the opportunity that Extreme Response, our partners and the people we serve provide us in being a part of changing lives. Jeramy and his wife Teresa hale from mid-Michigan and have been serving in Ecuador for five years. They have been serving as teachers, overseeing ER’s information technology and helping with Christmas teams and special projects. 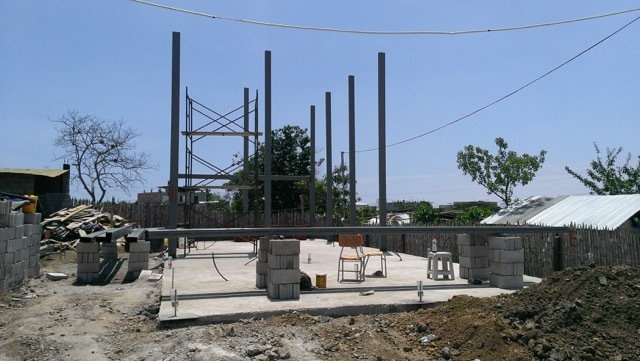 The Faith and Hope School in Perdenales was damaged so badly by the April 16, 2016, 7.8-magnitude earthquake that it became a safety hazard and needed to be torn down. ER staff inquired as to how we could help. Our contacts at the school told us the building was a danger to kids who might play in the ruins. They also indicated that it was not able to be salvaged, so the biggest need was for the school to be demolished. We told them we would like to provide the funds for the heavy equipment needed for the demolition. Here is one of the reasons we are supporting this project. Extreme Response coordinated a short-term construction team from a church in Pennsylvania that helped build the church. The church remains interested in, and supportive of, the Faith and Hope school to this day. The next step is to clear the debris from the site. Once the site is cleared, school administrators will need to hire an architect, submit plans for an earthquake-resistant design, obtain government approvals and then start rebuilding. ER plans to support these efforts and, when possible, send short-term teams to help with the reconstruction. Many thanks to ER supporters for funding the demolition. We’ll provide updates on the new school as it progresses through the design, approval and construction phases. Scroll below to our May 6, 2016, update to see more about the Faith and Hope School and ER’s other plans to help earthquake victims. Extreme Response’s Russ Cline had the opportunity to visit the school just prior to it being demolished and shared this short video. If you’ve been following our posts, you saw a story about ER helping a family rebuild its home, which was demolished on April 16 by the 7.8 quake. Yesterday the family was hit AGAIN when the second of two new quakes hit the coast. Their shrimp farm was severely compromised. Today, they are scrambling for both housing and a way to repair the shrimp farm. ER is sending staff to the coast to see how we can help. Watch this blog for updates. According to ABC News, “two powerful earthquakes jolted Ecuador on Wednesday, causing one death and injuring dozens. Neither appeared to have caused serious damage but the government decided to cancel school nationwide as a precaution. In Guayaquil, office workers fled into the streets after the second quake. Both tremors were centered along the Pacific coast near the epicenter of last month’s magnitude-7.8 quake and rattled homes as far away as the capital, Quito. Several of our Quito-based staffers awoke about 3 a.m. this morning feeling the impact of the first trembler that hit the coast of Ecuador. All of our staff members are safe. “An earthquake with a preliminary magnitude of 6.7 struck Ecuador early Wednesday, rattling an area still recovering from last month’s disastrous quake but causing only limited damage. The epicenter was 36 miles south of Esmeraldas at a depth of about seven miles, the USGS said. No tsunami alert was issued and Ecuador’s president Rafael Correa said there were no reports of major damage from the quake, which struck at 3 a.m. local time (4 a.m. ET). USA Today added this: A 6.7 magnitude earthquake struck Ecuador on Wednesday near the area where a 7.8 quake last month killed hundreds of people and caused widespread damage. 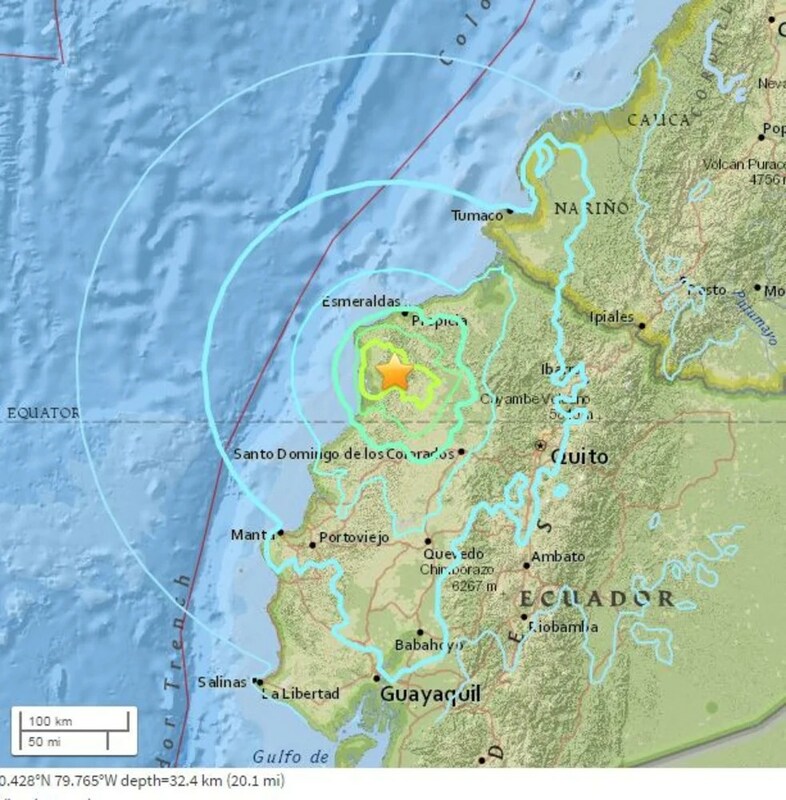 The U.S. Geological Survey said the quake’s epicenter was 21 miles from the town of Muisne in western Ecuador. Rafael Correa, Ecuador’s president, tweeted there were no early reports of damage. There were also no immediate reports of injuries. Today ER sent Paul Fernane of our Quito team to the coast to meet with partner Casa de Dios and survey the earthquake impact zone for needs that we can meet. Based on feedback from our first three relief teams and partners, we’ve identified five projects to pursue. After we receive Paul’s first-hand report next week, we will firm up these plans. 1. Help to rebuild a home for a family in Perdenales. The home was destroyed by the earthquake. As of today, we estimate the cost for this project will be about $10,000. 2. Supply the remaining building materials needed to finish the home being rebuilt in Perdenales next to the shrimp farm (see May 2 Blog entry). We estimate the cost for this to be about $1,500. 3. Help meet the needs of a family in Perdenales whose home was completely destroyed, but has an opportunity to move into another house that needs some repairs. We need to inspect this project, but our initial “rough” estimate is $2,500. 4. There is a school in Perdenales that was destroyed by the earthquake. Yesterday we committed $2,000 to tear down the damaged structure and remove the rubble to make it safe for the community. From there, we need to hire an engineer to produce plans for a new school building. Rebuilding the school could take a year. We won’t have cost estimates for a while, but this is a project that will require the help of several organizations. 5. Food, Water and Hygiene Kits. We will be working with Pan de Vida, Inca Link and other organizations in Quito to determine what relief needs still need to be met in the hardest hit areas. Our plan is to use a combination of local food drives and purchased items to create a a bulk distribution. This would likely take place within the next two weeks. The road to recovery will be long and grueling for coastal Ecuador. According to the United Nations News Centre, 660 deaths have been recorded thus far. Spokespeople for Ecuador said the country’s call for $72.7 million in financial assistance has received little support and the United Nations humanitarian aid wing is urging donors to contribute to projects that benefit the affected people. The UN Office for the Coordination of Humanitarian Affairs (OCHA) reported that nearly 7,000 buildings have been destroyed and 560 schools have been affected, with 166 of them suffering medium to severe damage. Health assistance has been provided to 513,762 people, including 4,605 injured during the first 72 hours of the emergency, and the number of people in shelters has decreased to 22,754. Emergency relief is giving way to rebuilding housing, schools, and infrastructure. If you would like to contribute to ER’s relief efforts, designate your gift “Ecuador Earthquake Relief”. Thank you for helping the people of Ecuador! “Jeremy Hing and I made it to pastor Fabián’s parent’s place. As you can see they lost their home. They live and work a shrimp farm in a remote area on the (Ecuadorian) coast. We had to take a canoe ride through the mangroves to get materials to their place. We cut the beams with a chainsaw and used our generator for electricity. Fabián brought some teens from their youth group to help. They were great helpers. It was crazy hot, muddy and buggy, but there was not a word of complaint as we worked long after dark and were up again at sunrise. I was really impressed with that group of kids. We also spent our evenings talking about how blessed we all are. It is quite amazing that the family just lost most everything and barely escaped with their lives as they were buried under their house. We were so blessed their faith. We go to bless and end up being blessed. ER is working with partner Casa de Dios located in Pacoche, Ecuador, to help people directly impacted by the 7.8-magnitude earthquake that destroyed much a tremendous number of homes, schools, retail establishments and infrastructure on coastal Ecuador on the night of April 16. Our third relief team went to Perdenales to help rebuild the home of a family of shrimp farmers whose home was destroyed. The family includes the parents of Casa de Dios director Fabián Buenaventura. The road to recovery will be long and grueling for coastal Ecuador. Thank you for helping the people of Ecuador! Extreme Response’s third relief team traveled to the coastal town of Perdenales, which hit extreme hard by the 7.8-magnitude earthquake on April 16. ER’s Pete Emery and Jeramy Hing went to great heights to deliver building materials and help reconstruct a home that was destroyed by the Ecuador earthquake. Perdenales is largely uninhabitable following the earthquake. ER is working with partner Casa de Dios to help distribute relief supplies and identify rebuilding projects. CNBC is reporting that “Ecuador’s President, Rafael Correa, has estimated the cost of damage at $3 billion or 3 percentage points of the country’s gross domestic product, according to political risk consultancy, Teneo Intelligence.” The news organization also reported that Ecuador has asked the International Monetary Fund for a loan of $368 million in aid. Scroll below for additional recent earthquake coverage. More than 280 schools have been damaged by the earthquake that hit Ecuador on April 16, leaving at least 120,000 children temporarily without education, the according to UNICEF (UN’s Children’s Fund). The death toll from the quake is at least 654, 12,492 were injured and 26,000+ are living in shelters, according to Ecuador’s Risk Management Office. Yesterday, ER’s Pete Emery and Jeramy Hing loaded building materials onto “ERnie”, our Quito work truck that is used by volunteer teams for building projects. They got up super early this morning to make the long drive to Perdenales, a coastal town severely damaged by the 7.8-magnitude quake that hit Ecuador on April 16. This is ER’s third relief team. The goal of this trip is to provide materials and support for the construction of a home and to deliver supplies to a school. We are working with partner Casa de Dios. Another long-time ER partner, Pan de Vida, shared this update yesterday on its relief efforts. Our third relief team has packed supplies to depart tomorrow at 4 a.m. for Perdanales on Ecuador’s coast, bringing building materials for a small home and supplies to help a local school. It will be a challenging trip for the team members, who plan to sleep in tents because the area has endured tremendous destruction. The team will be working through ER partner Casa de Dios. Thank you for helping the people of Ecuador! (Tuesday April 26, 2016) With our first two relief teams having returned to Quito for rest and recovery, we are now planning future aid to the victims of the 7.8-magnitude quake that hit the coast of Ecuador on April 16. See below for some of the statistical updates. As of today, Extreme Response is preparing a third relief team to depart later this week. Members from the first two teams have identified a project to provide shelter for a family that lost their home to the earthquake. We will be working with partner Casa de Dios on this project. Stay tuned for updates. As response teams shift from rescue and immediate relief, organizations inside and outside of Ecuador are strategizing on how to provide sustainable relief. The UN has announced its desire to help by providing food for about 250,000 people. Samaritan’s Purse has established a field hospital and has treated hundreds of earthquake survivors. ER partner Pan de Vida and affiliate Inca Link have been collecting and distributing aid for several days. *The death toll climbed to 654 Saturday evening, according to Ecuador’s Risk Management Office. Separately, there are many outcomes of the earthquake that tug at our heartstrings. For example, did you hear about the search dog who died helping find people in the rubble? Scroll below for additional coverage. (Sunday April 24, 2016) Both of ER’s relief teams have returned to Quito from the coast of Ecuador having delivered all of their supplies and helping many people in need. The second team was able to load of an entire bus with seven tons of additional supplies and deliver them. It took the team 22 hours to make the delivery roundtrip. As of this morning, the death toll from the earthquake has risen to 654, with 12,492 injured and 29,061 living in temporary shelters, according to CNN. The coastal area also has received more than 700 aftershocks. Jeramy Hing connects with a machine driver who was clearing rubble. 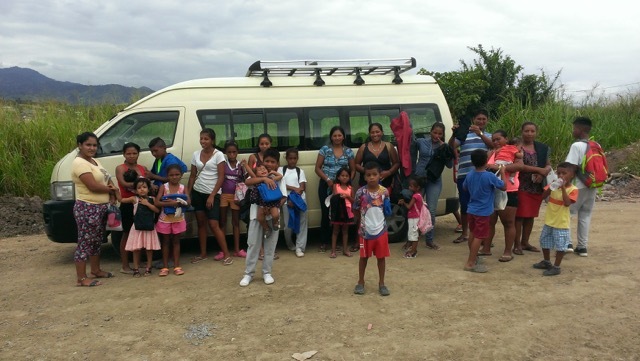 The supplies are now in the hands of ER partner Casa de Dios, which has a secure building in Pacoche where they will store the food, water and other life-sustaining items. Casa de Dios provides several humanitarian and community development services to the neediest people in Pacoche, such as food distribution, construction projects, educational and outreach programs and water cisterns. ER is committed to working with Casa de Dios and helping the people of the Pacoche area recover. This week we will be evaluating both short- and long-term needs to determine how ER staff, volunteers and supporters can best help going forward. Our two relief teams saw the devastation first-hand, so we will have solid insight on what to do next. We will need your help to provide ongoing support. We know from experience (earthquakes in Nepal and Haiti and ) that disasters create a broad spectrum of needs that vary from community to community. We also know that people will need help for many months (or years) as rebuilding homes and infrastructure takes time. Thank you for helping the people of Ecuador who have been impacted by this earthquake! (Friday April 22, 2016) Our second relief team is prepped and ready to roll early Saturday morning. The goal is to provide life-protecting supplies to the victims of Ecuador’s 7.8-magnitude earthquake and numerous after-shocks. They’ve already purchased the 7 tons of supplies, packed them for transport and will load them shortly. The team is headed to Pacoche, an area on the edge of the earthquake destruction, but still intact. We’ll be working with ER partner Casa de Dios, an organization that has a secure facility that will serve as a distribution point for the supplies. Here’s a partial list of what the team is bringing: 2000 pieces of bread, 480 large cans of tuna, 580 kilos of rice, 1600 gallons of water, 640 cracker packets, 40 bags of instant milk, 13 kilo of peanuts, 16 kilo of noodles, 500 trash bags, 2500 plastic cups and 240 candles. Add in a few hundred bags of popcorn and additional supplies, and it will be a tight fit on the transport, according to Ben Baumer, who is heading up the second team. Separately, our first relief team that departed earlier this week is distributing the last of its supplies in Pacoche. The coastal area of Ecuador continues to be rocked by earthquakes and aftershocks. The team has reported feeling seven aftershocks where they were working today. ER is committed to working with Casa de Dios and helping the people of Pacoche recover. But we need your help in order to continue providing support. Thank you for your help! URGENT, DIRE HELP NEEDED FOR EARTHQUAKE VICTIMS! ER exists to help people living in extreme, sometimes LIFE-THREATENING situations. (Thursday April 21, 2016) Today we are shouting the “LIFE-THREATENING” portion of our mission statement because people in Ecuador are DYING and we are compelled to help. We are asking for your immediate, generous support in order to respond. Last night our relief team reported conditions in coastal Ecuador are far worse that we had hoped. Earthquake victims are so desperate for food and water that robbery and chaos are ruling the moment. CNN reports today that 570 have died, 7,015 are injured and 155 are missing. These numbers will rise. Our team is safe, but out of supplies. Today they will use the last $1,000 of their funds to purchase food and water and deliver them to our partner in Pacoche, which will serve as our distribution hub. ER staff and friends load a truck with supplies for the relief trip to the coast. In response to our relief team’s first-hand report and their pleas to do more, we are preparing a second relief team RIGHT NOW. They are purchasing $4,000 of food, water, medical supplies and blankets. Our plan is to take these supplies to our partner Casa de Dios in Pacoche, which has a secure building. The supplies will be stored there and distributed to people who are in dire straights. We are using the last of our cash on hand in Quito to purchase these supplies. We are asking for your urgent support to allow us to fund these relief teams and future relief work that will take place in the days and months ahead. For our friends living in Quito, you are welcome to bring non-perishable food, bottled water and medical supplies to ER or to Pan de Vida, an ER partner that also is preparing to deliver supplies. Thank you for caring for these people. With your support, we can bring survival and hope to those in desperate need! Staff load a truck with supplies for the relief trip to the coast. A team of volunteers left Quito for an area that was heavily impacted by the earthquake. Note: A new 6.1 quake hit early Wednesday morning off the coast of Ecuador. A team of a dozen or so volunteers left Quito early Wednesday morning to head for Portoviejo, and area heavily impacted by the earthquake. Please keep the team in your thoughts. There are challenges with robberies, confiscations, poor road conditions and checkpoints where some relief volunteers are being turned around. The good news is all ER staff and partners are safe. The majority of our staff live in or near Quito, 100+ miles from the epicenter of the massive 7.8 magnitude earthquake that hit the western coast of Ecuador around 7 p.m. Saturday night. The bad news is this Ecuador’s worst disaster in 60 years with 500+ people having died thus far and more than 4,000 have been injured, as reported by CNN . Infrastructure has been decimated for miles. ER’s small team is traveling by vehicle from our base in Quito to the western coastal region where many are struggling with basic supplies. The team will assess short- and long-term needs of the region so we can plan additional support. The team is traveling with other volunteers from the area. ER partner Casa de Dios is located in Pacoche, which is within the quake zone. Our contacts Fabian and Graciela are safe, but they are surrounded towns that have crumbled buildings, broken roads, landslides and more. Fabian has confirmed great destruction in their his parent’s home town. Extreme Response intends to help Casa de Dios help its neighbors <who are victims of the earthquake. As our advance team collects details, we will share them in this blog. In the meantime, we are asking for donations to cover immediate costs for food, water, gasoline, blankets and other emergency supplies. This will be followed by longer-term help. Watch the ER blog for updates during the next few weeks. (Sunday April 17)….First, the good news. All ER staff and partners are safe. The majority of our staff live in or near Quito, 100+ miles from the epicenter of the massive 7.8 magnitude earthquake that hit the western coast of Ecuador around 7 p.m. Saturday night. The bad news is 272 (updated on 4-16) people have died thus far and more than 2,500 have been injured, as reported by CNN. Infrastructure has been decimated for miles. ER partner Casa de Dios is located in Pachoche, which is within the quake zone. Our contacts Fabian and Graciela are safe, but they are surrounded towns that have crumbled buildings, broken roads, landslides and more. Extreme Response intends to help Casa de Dios help its neighbors. As we receive details, we are asking for donations to help provide immediate assistance (food, water, shelter) for those facing imminent danger. This will be followed by longer-term help. If you would like to donate to this disaster response, visit https://www.extremeresponse.org/donate-now. Please designate your gift “Ecuador Earthquake Relief”.